Fairlady #1 review: An intriguing start – AiPT! What happens when you take the conceit of a mystery procedural series and apply it to the fantasy genre? That’s the premise of Fairlady, set in a mysterious and rich realm full of lizardmen, dilapidated mech wreckages, super wizards and plenty of the implausible. Taking a simple, accessible and universal convention of street-level crime investigator and applying it to the wider world of a fantasy universe that boasts its own unique history, people and more is a smart idea. Brian Schirmer, Claudia Balboni, Marissa Louise and David Bowman are working with an impressive premise here and it’s one with a lot of room to grow. One of the most exciting and intriguing things about the book, right off the bat, is each issue is a standalone mystery with a proper beginning, middle and an end. In the age of written-to-trade arc narratives with some degree of decompression, it’s refreshing to see a title attempt done-in-one stories that pack in a lot each time and hook you in for more. There’s been a bit of a return to the format here and there in recent years, with Grant Morrison currently making great use of it in The Green Lantern. And it’s an approach that very much fits with the mystery procedural routes that the book draws on as well, thus each tale is dubbed a “Case” and follows the lead protagonist: Jenner Faulds and her anthropomorphic cat-warrior companion, Oanu. Right out the gate, Fairlady makes a strong impression. Schirmer’s dialogue, delivered by Bowman, never feels archaic but has just the tinge of fantasy needed, with his characters sounding believable and accessible to a contemporary audience. The natural flow of it and the voices of both Faulds and Oanu is a definite strength here. Instantly you know what we’re dealing with here. On one hand, you have the thoughtful and unrelenting investigator and alongside her, the ball of power you don’t mess with. The Gordon and Bullock, if you will. It’s a winning dynamic and both characters pull it off, bringing in a fun new spin to the age-old setup. One of the most interesting and comforting elements of the book here is just how at ease the characters are. They know one another, they have history, they know what they’re doing and they just do it. They’re not rookies, there’s no new rocking-the-boat moment, they’re good at what they do, they know what needs to be done and they do it. It’s like a well-practiced and performed dance and the pair are great to watch in motion. The other thing the book nails beyond the characters is the world. Babloni’s shots of fantasy cities and towers are some of the most lovely, while Louise brings the magic with phenomenal colorwork. The debut of the wizard tower in particular is a huge standout moment, where in white and blue specks line the darkness of space and a gorgeous light effect is used to punctuate the power of the tower’s gigantic light-source. The misty and surf-like clouds that surround the infinitely long tower get across its impossible power perfectly and the reader is merely left in awe. It’s a striking image that stands in contrast to the rest of the book, which is mostly steeped in hues that fit a crime book. Bowman’s letters, with all the setting fonts to establish and emphasize location, is incredibly stylish here. You’re immersed and the placement delivers the best of the characters, gently nudging the reader along. The only read hurdle is the captions, which have a typeface that slows down the reader to parse, in great contrast to what’s been set up. The contrast is the point, but the font can take a little getting used to and in the process break the otherwise seamless immersion. But beyond that, even the SFX is a delight, right from page one’s sleek, white PAWW! The general narrative for this case, dubbed “The Case Of The Blue Rock,” is a bookkeeper with a debt and a history of embezzling money going missing. Riding on their polar bears, spying on homes and interrogating octopus-bearing crook, the pair manage to solve it, as you might expect. But it takes them all over this place, weaving through various parties by the time the resolution strikes. It’s a solid story, but it could certainly use a stronger conclusion or hook to land the conclusion a bit further and keep the reader psyched for what may come in the future. 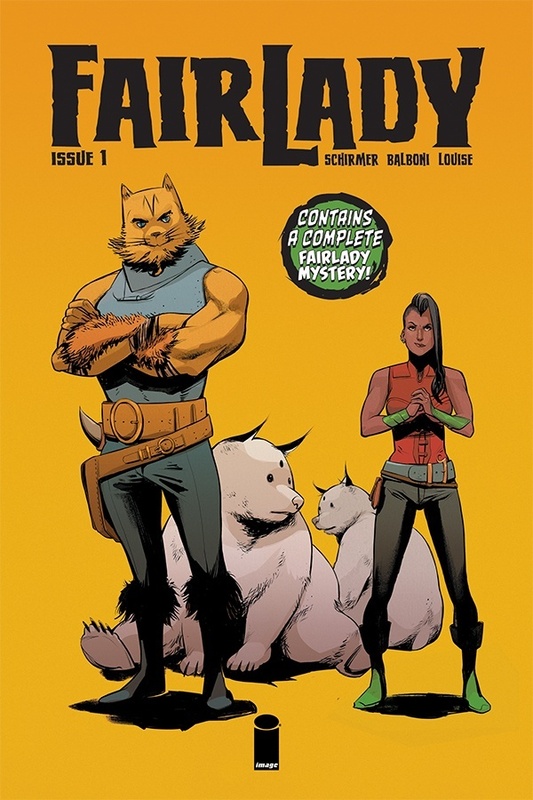 Fairlady #1 is a promising start that effectively establishes its characters and world, giving the readers a taste for what they can come to expect. Given its absolute value for money with the content and procedural nature alongside a fun premise, it’s sure to appeal to a great many. This is one to watch out for — it’s a grand old time. Could definitely use more of a hook in the latter end to grab the readers a bit stronger for the next time, despite the procedural setup.